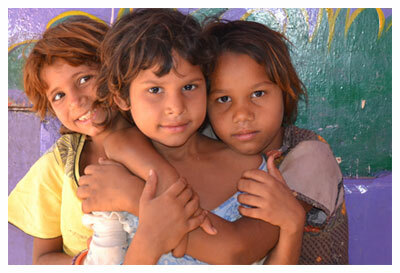 Help us alleviate the plight of slum children and destitute families in the subcontinent of Inda. The El Shaddai Charitable Trust is a registered, non-profit charity working in Goa and other states in India, implementing the Child Rights Act 2003/05 for orphans, street children and children coming from economically desperate conditions; cared and provided with food, clothing, shelter and education, for a better future. We have residential homes, community centres, a non-formal school, day care & night shelters, plus cottages for the seniors who are attending University, colleges, technical institutions and professional training centres in Goa. In India, there are more than 425 million people living in poverty. In addition, we have Outreach projects in Nagpur, Karnataka and Kerala. We have a free food and clothes distribution programme in the slums in Goa. Vision "Bringing childhood to children who have never had it". El Shaddai Indian Street Child Rescue (EISCR USA) is a registered charity created to raise funds and provides support for efforts by Indian NGO's directed at alleviating the plight of slum children and destitute families in India. Site Map Copyright (c) www.indianstreetchildrescue.org. All rights reserved. Optimised by Adept SEO Design by FCT.